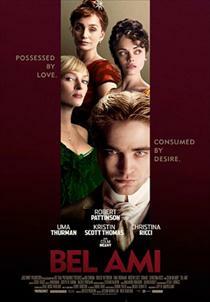 The recently-released second poster of the movie 'Bel Ami' shows Robert Pattinson in an intense smoldering gaze as three of his lovely lady co-stars look on from behind him. Uma Thurman, Kristen Scott Thomas and Christina Ricci star as the women Pattinson's character Georges Deroy seduces on his way to the top. The film, which is based on the classic French novel of the same name by author Guy de Maupassant, is set to premiere at the Berlin Film Festival on February 17. The film will make its U.S. debut on March 2nd.